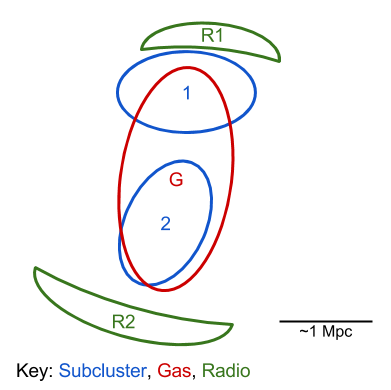 The first evidence for A1240 being a radio relic system was presented by Kempner & Sarazin (2001). They found that the diffuse emission detected in WENESS and NVSS images were consistent with the elongated X-ray emission from a pointed ROSAT observation, and they noted that the slightly off-axis location of the relics may suggest that the merger had a non-zero impact parameter. Bonafede et al. 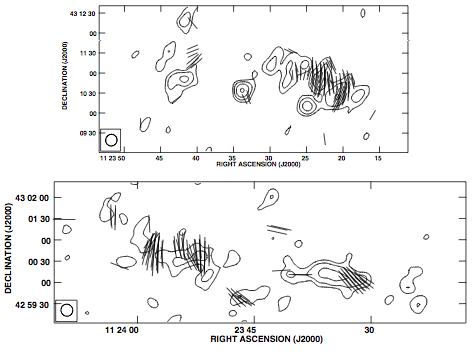 (2009) confirmed the presence of the two relics with VLA observations at 325 MHz and 1.4 GHz. They estimated average spectral index values of 1.2+/-0.1 and 1.3+/-0.2 for the northern and southern relics, respectively. The spectral index distribution, while patchy, showed the typical trend of being flatter at the outer edge of the relics and falling off towards the in inner edge. Bonafede et al. (2009) also measured a mean fractional polarizations of 26% and 29% for the northern and southern relics, respectively, with both having values ranging up to 70%. Barrena et al. 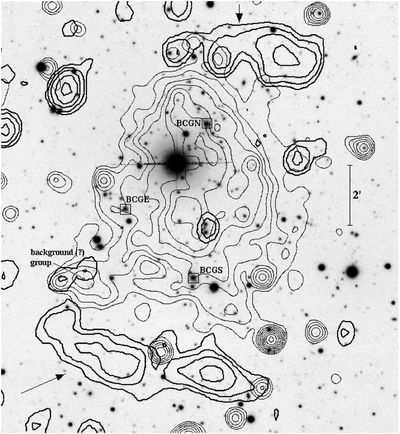 (2009) carried out a photometric and spectroscopic survey of the system. They obtained relatively shallow BR imaging with the INT-WFC, under 1.1" and 3" respectively (thus not sufficient for lensing). They used the TNG-DOLORES/MOS to obtain 118 spectroscopic redshifts, and combined this with 32 publicly available redshifts. 95 of these spectra were considered cluster members leaving 50 non-member redshifts (after accounting for catalog overlap). 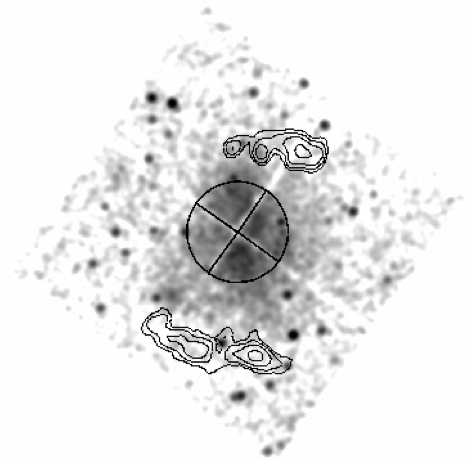 With both their and SDSS imaging they find evidence for a north-south bimodal subcluster distribution. This is further confirmed by their spectroscopic analysis and suggest a line-of-sight (LOS) velocity difference between the two subclusters of ~400 km/s and using a two-body model they estimate a rest-frame velocity difference of ~2000 km/s. They measure a LOS velocity dispersion for the system of ~870 km/s and corresponding mass of ~0.9-1.9e15 Msun. Based on Barrena et al. (2009). 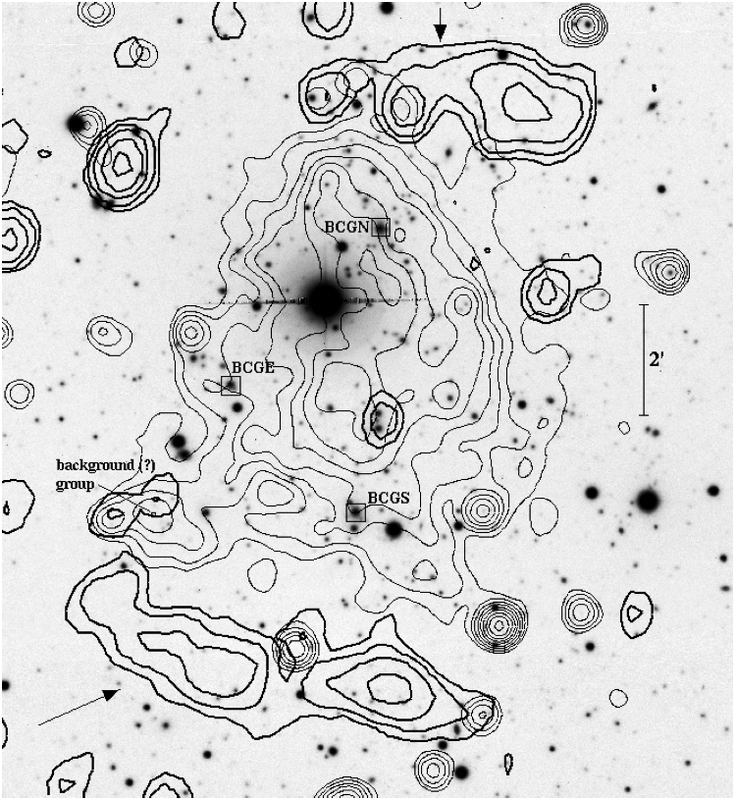 Bonafede, A. et al., 2009. Double relics in Abell 2345 and Abell 1240. Astronomy and Astrophysics, 494(2), pp.429–442. Barrena, R. et al., 2009. 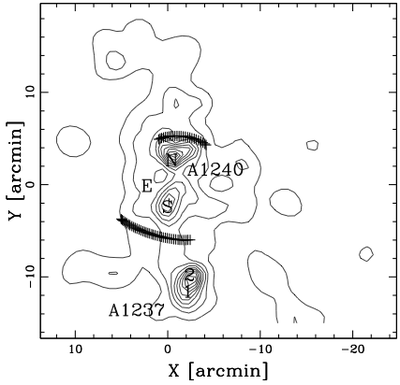 Internal dynamics of Abell 1240: a galaxy cluster with symmetric double radio relics. Astronomy and Astrophysics, 503(2), pp.357–371.